Just as we did in our original Momentus XT review, we'll start with a look at some hand-timed application tests. First up is a good old fashioned boot test. I measured boot time on our testbed from POST to first seeing the mouse cursor on the Windows 7 desktop. This isn't a timing of actual boot-to-use since more loading happens even after you get to the desktop, but it does encapsulate much of the Windows 7 boot process. All tests were repeated until performance leveled off. In the case of an SSD, this was after just one run. In the case of the 500GB Momentus XT, it took five runs to get there, whereas the second generation model was there after just two. The traditional hard drives each took a few runs for their performance to stabilize as well due to Windows 7's own boot optimizations taking effect. Boot performance continues to be very impressive on the Momentus XT. It's still not quite as fast as a high end SSD, but it's definitely faster than a traditional hard drive (even a faster, 3.5" model). With a larger NAND cache, your boot time is more likely to remain this low even as other applications and data are pulled into the cache. Next let's look at a simple application launch test. Adobe Photoshop continues to be one of the more stressful workloads for a hard drive, even down to launching the application. Here I measured from the time I clicked on the Photoshop icon in the Start Menu to first appearance of the blank Photoshop canvas and toolbars. Again, I repeated this test until performance leveled off in all cases. For the Momentus XT performance fluctuated and it never truly settled on a single launch time. Performance started out at over 5.6 seconds but for all runs after the 2nd launch time ranged in the upper 2s - upper 3s. For its results as well as those from all of the hard drives, I averaged five launch times and presented those averages. The lone SSD in this comparison delivered consistent performance across all runs. 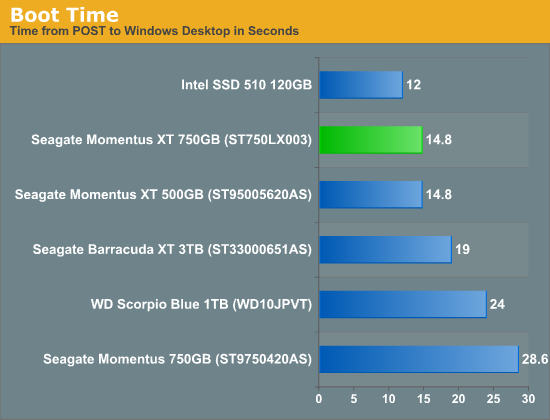 Here the Momentus XT continues to do very well, for a hard drive. It's faster than any of our mechanical drives, and significantly faster than your run-of-the-mill 5400RPM 2.5" drive for sure. 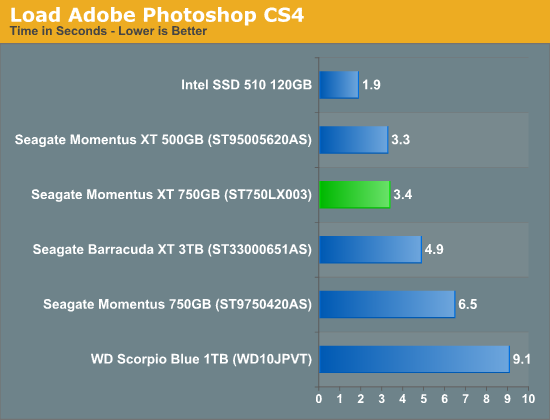 A good SSD is still around 70% faster than the Momentus XT. When constructing our Visual Studio 2008 project build benchmark for our CPU reviews I was reminded just how much of a pain it is to do development work on a system with a hard drive. I tried using the same benchmark to measure drive performance however it seems I used too good of a CPU benchmark as disk performance plays a small role in actual compile time here. 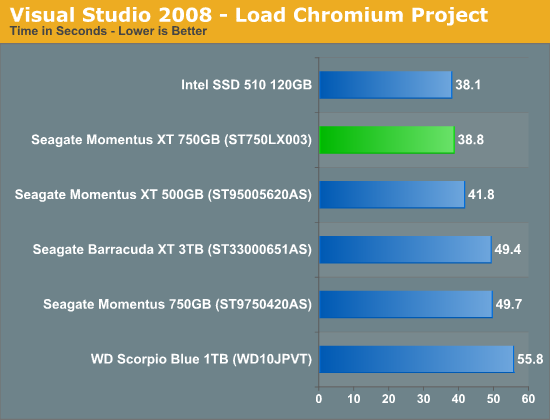 Instead I looked at the impact of disk performance on loading the Chromium project in VS2008. I used the same test rules as before, presenting performance once it has leveled off for all drives involved. Once again, the SSD delivered peak performance after a single run. The Momentus XT was able to do it after 2 - 3 runs. Performance didn't improve over multiple runs with the traditional hard drives. There's a clear division between the NAND equipped Momentus XTs and the traditional hard drives here, but not so much between the former and the Intel SSD 510. I can definitely understand Seagate's temptation to draw the comparison to the performance of an SSD. The problem with doing this is highlighted in my comments above however. While the SSD always performed to the best of its abilities in our tests, regardless of the number of times I ran a test, the Momentus XT needed a couple of runs to get to that point. The NAND cache isn't overly predictive and as a result the first time you do almost anything the Momentus XT will perform like a traditional 7200RPM 2.5" hard drive. Given a light enough workload, the Momentus XT should be able to eventually fit much of the most frequently read data into its cache, but the process of actually getting there can still be painful. For our last application level benchmark I turn to something I've used since the early days of SSD reviews: the fresh test. Take our boot test from earlier, and string together a series of application launches after you hit the desktop. In this case I'm launching Excel 2007, PowerPoint 2007, Word 2007, Visual Studio 2008 and Photoshop CS4 as soon as the system boots. I measure the time from POST until the last application is completely launched. I call this the fresh test because when you first build a machine everything, even on a traditional hard drive, performs quickly. Load up a lot of applications and use your system for a while and you'll soon notice that things aren't quite as snappy any more. Defragmenting your drive can help but after a certain point it's the bloat of everything installed that really limits performance. A better test would be to use an image that was months (if not years) old, but I've found that this benchmark gets the job done. Lower numbers here translate very well to a snappier system and one that feels new regardless of what you've got loaded on it. 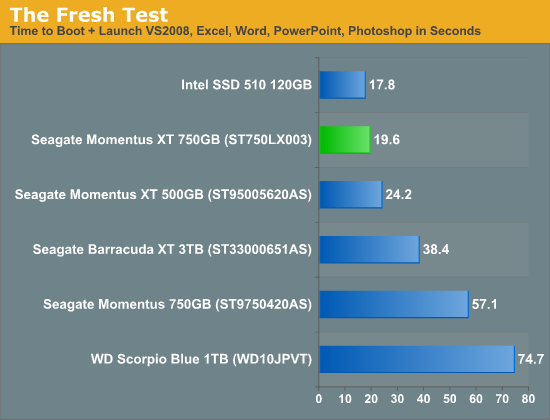 SSDs truly excel in the fresh test, but what about the Momentus XT? Surprisingly enough, the Momentus XT does extremely well. The newer model clearly does a better job of keeping more data in NAND, but both are head and shoulders above the traditional hard drives. If you have a fairly regular usage pattern (E.g. you always run the same 5 or 6 applications), the Momentus XT can significantly improve the overall user experience. In some cases, it can even approach the performance of an SSD.